The Motts Run Reservoir Recreation Area is an 860-acre natural area, including the 160-acre reservoir. The Trail System currently has 4.1 miles of biking and hiking trail (multi-use trail) and 4 miles of hiking only trail. This trail can be ridden by all skill levels and ages. Would you like to use this map on your phone AND see where you are on the map in real-time? If your answer is yes; Download the free Avenza Maps app from the app store on your phone. Avenza Maps® is a FREE mobile map app that allows you to download maps for offline use on iOS or Android smartphone or tablet. Use your device’s built-in GPS to track your location on any map, plot locations and photos, measure distance and area, and more. Simply search for Avenza, Get the app, download the map below, and see where you are on the map in real-time!! 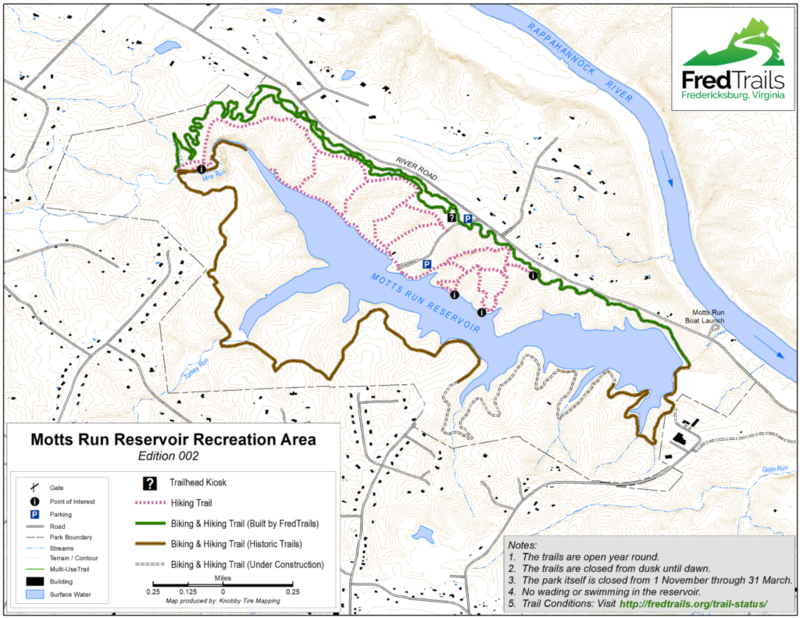 Download the Motts Run Reservoir Trail Map by clicking on this link or the map below. Need Directions to the Motts Run Reservoir Trail System?